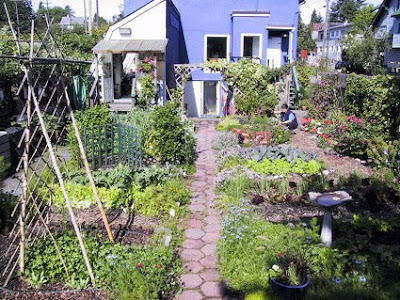 City Farmer and it's 'Urban Agriculture Notes' has been around offering great urban agriculture links from Vancouver, BC for a number of years at their old, no-frills site and their demonstration garden. I was pleased to visit recently and see the link to the new blog-ish City Farmer News (added to the BlogCheck) site and tap into a number of those recent posts of some pretty tasty urban-ag happenings. A compelling profile of the CERES farm, located in Brunswick East, Victoria, Australia. CERES stands for Centre for Education and Research in Environmental Strategies, and is also the name for the Roman goddess of agriculture. From CFN: "CERES farm demonstrates how an urban city farm can contribute to the local community by providing locally grown organic food, education in community food systems, a happening & ethical market place and employment for farmers, teachers and market workers." With a goal of encouraging urban agriculture, "City Farmer teaches people how to grow food in the city, compost their waste and take care of their home landscape in an environmentally responsible way." 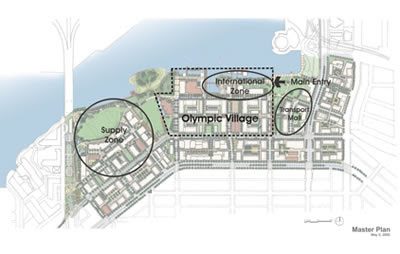 One notable example is the study for urban agriculture around the upcoming 2010 Olympic Games in the Southeast False Creek are of Vancouver. From the City of Vancouver: "SEFC will be a model of sustainable development. Unique features include: urban agriculture; a rainwater management system; green roofs; and a neighbourhood energy system." There are links to a number of studies available by Holland Barrs Planning Group, which outline some of the urban agriculture goals. 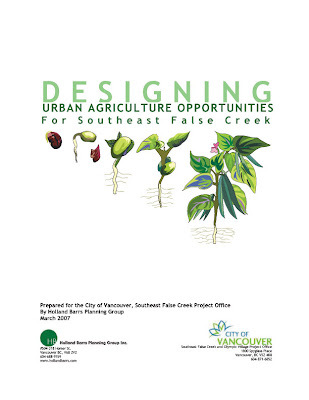 One such study centered around 'Designing Urban Agriculture Opportunities for Southeast False Creek, Vancouver, BC' and described a number of strategies for planning and desing urban ag into the fabric of the community. 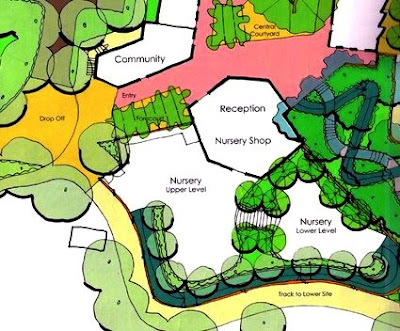 A summary from the Holland Barrs site: "Develop design considerations and guidelines, technical considerations, and management strategies for effectively integrating urban agriculture (UA) into a high density neighbourhood. The report focuses on how UA is an innovative tool for urban design and can play a key role in building community around food. Topics covered in the report include: perspectives on food security, design principles for UA, a UA space typology, design ideas and considerations for UA in the public and private realms, technical considerations and support systems necessary for UA, and management strategies for endurance of the UA program over time." From a more historical viewpoint is a short profile of the book by University of Western Australia prof Andrea Gaynor entitled 'Harvest of the Suburbs' which definitely piqued my interest in some historical precedent from Australia for urban agriculture.. From CFN: "Drawing upon sources ranging from gardening books and magazines to statistics and oral history, Gaynor presents an environmental history of non-commercial suburban food production in Australia. Her narrative traces animal, fruit, and vegetable production from the close of the 19th century to the present day. Particular attention is paid to the effects of economic conditions on home food production." 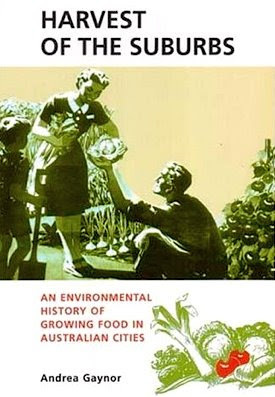 And today we end with a related urban-ag link that was pretty funny came via Treehugger and the Wayback Machine to the not so-distant past of 1984 and a book entitled 'The Future World of Agriculture' offered by none other than Disney. 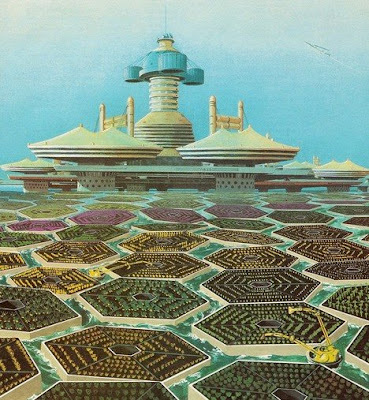 And much the series title, Epcot (which I did visit with horror as a 9 year old in 1982) - this is a horribly dated and dystopia view of agriculture fits right in... where "Robots tend crops that grow on floating platforms around a sea city of the future. Water from the ocean would evaporate, rise to the base of the platforms (leaving the salt behind), and feed the crops." Yikes. I can't help but think of the machine-harvesting human pods in The Matrix, but I'm sure that would never happen... right? Unlike the 'utopia' shown above, City Farmer News offers wide-ranging and practical solutions to encourage site- and city-scale urban agriculture. And you will find that robots are seldom necessary. Check it out.